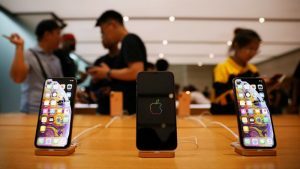 Apple Inc.’s new generation iPhones reached store shelves across the globe on Friday, featuring components manufactured by Toshiba and Intel amongst others, according to a pair of top companies that broke open the new Apple models. Supplying parts for an iPhone is looked at as a coup for chipmakers as well as other manufacturers. Apple publishes a long list each year of its suppliers, it does not release which companies make each of the components and insists that its suppliers remain silent. That means the only ways of determining the makers of individual parts, the phones must be taken apart and inspected. At the same time, many analysts warn that conclusions should not be drawn since Apple is known to use more than a single supplier for one part, which means what one finds in one iPhone, might not be found in another. The lists supplied of a parts breakdown did not include parts from Samsung nor did it have chips made by Qualcomm. Samsung had supplied iPhones in the past with memory chips and was thought to be by analysts the only supplier of the displays for the iPhone last year. Qualcomm has supplied components for several years to Apple, but both tech giants are locked in a legal dispute where Qualcomm was accused by Apple of using unfair licensing practices for patents. Qualcomm, based in the U.S., is the largest chipmaker in the world for mobile phones, has accused the iPhone maker of patent infringement. In July, Qualcomm said Apple was going to only use competitor’s modems in tis upcoming release of a new iPhone that took place earlier this month. The teardown of iPhones by iFixit showed that the two new iPhone models used Intel’s communication chips and modem rather than hardware from Qualcomm. According to the iFixit study, the new generation iPhones also have NAND and DRAM memory chips made by Toshiba and MICRON technology. A previous inspection of an iPhone 7 showed DRAM chip from Samsung in some of the models. DRAM was found from Micron but the NAND memory came from SanDisk in some of the models. SanDisk is owned by Western Digital and works together with Toshiba to supply NAND chips. One thing is for certain, Apple is not putting all its eggs in one basket, but using several different suppliers for its flagship handsets.